A suite of four, thematically related, site-specific film installations. The artwork articulates ideas and art practices in re-making, de-nature, ephemeral architectures, cinema citation, film montage, cultural representations of China, utopias and art. 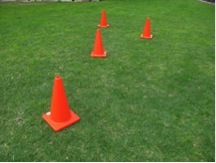 A large number (100), red plastic traffic cones, witches hats, placed over a bright green lawn at a specified site. The grass is transformed into a bright Technicolor field of colour-saturated vibrations of light and air, like a field of red tulips; or a green lawn in a David Lynch’s film, somewhere over the rainbow. The hats are arrayed in a designated pattern. Some may be standing up or lying down, on the side, over the green lawn, as if folded down, like megaphones. A sound score may include riffs from the Wizard of Oz. In this elaboration a significant temporal element is added to the constructed site in installation 1: beginning with a freshly raked ‘black’ soil, followed by the spreading of seeds, as if a fresh patch of lawn or turf was being seeded and laid out. The red plastic witches hats, are laid over the soil or dirt: their appearance on the dark soil, out of place, like alien invaders – more so than in the green grass above. The ‘hats’ cover and shade the soil from the sun (like sunblock cream), turn sunlight into darkness, thus preventing those seeds under the ‘hats’ from germinating. Alternatively, if the site of installation has its beginning with the grass already there (installation 1), the material affects of the objects, hinder growth, bleach out and turn the green colour of the grass into yellow; sunlight and air leave an imprint, inside-out, whether sun-lit on the outside and sunless inside: light and darkness, life and afterlife at work, acting together – at the same time. Time is covered up, lapsed, obscured, de-natured. The time and spatial scale of the installation may vary depending on context and circumstances of its construction – temporally linked to a specific cultural or art event exhibition. Unlike the other two, this installation, and the video one below, would be paired and constructed within the same viewing space inside, in a gallery or selected site. Installation 3 comprises several electric pedestal fans (Modern Living brand), adjustable height, 50 cm with remote control, white. 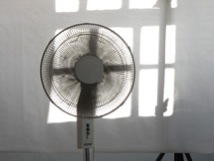 The fans spin and oscillate at varying speeds. Stainless steel queue stands, linked by steel wires, placed in front of the fans in a designated pattern. A young man skating on a sidewalk. The skateboard slips off and overturns, to reveal on its underside, a stick-on label with the words, CHINA, in red-black bold letters. The sudden flip action – comprising two shots appears and disappears like a film cut: a collision of two disparate images collaged like the stick-on label under the skateboard. The action goes on in a loop.